​A fun, beginner friendly class for a high intensity, low impact workout. 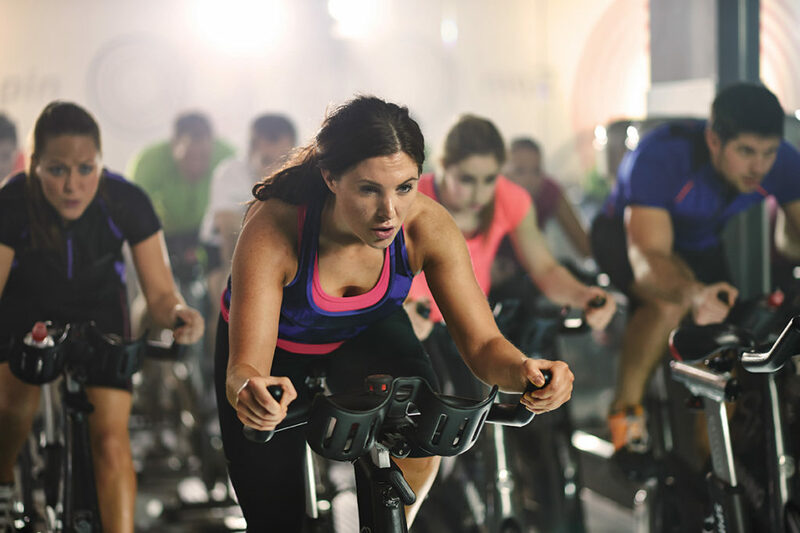 Spinning, also known as studio cycling, is an intense workout used to strengthen your heart and tone your legs & muscles. The spinning workout involves being perched atop special stationary bikes. The ride will / should include sprints, hill climbs, and other fun exercises like intervals and circuits. Classes are usually 60 minutes long and are set to music. Spinning bikes are equipped with a weighted flywheel in the front that picks up speed as you pedal, and the seats and handlebars are adjustable, so you feel like you’re riding on a real bike. Each bike has a knob below the handlebars that allows you to adjust the tension, making pedaling either easier or harder, as you simulate riding down flat roads, up mountain sides, and down hills. Spinning scorches about 7.2 to 13.6 calories per minute, or about 500 calories per class. All that pedaling is also great for leg toning as it strengthens your glutes, thighs, and calves.